Neurovascular Devices Market size was valued at USD 1.7 billion in 2017 and is expected to witness more than 3.8% CAGR from 2018 to 2024. Growing number of cases of brain aneurysm and ischemic stroke across the U.S. will be major factor driving market growth. Ischemic stroke is the highest occurring subtype of stroke in the U.S. and stroke is the fourth leading mortality factor. According to The American Journal of Medicine, approximately 795,000 strokes occur each year in the country. With increasing geriatric population across the country, burden of ischemic stroke is rapidly rising that will result into substantial demand for neurovascular devices over the upcoming years. Increasing patient demand for minimally invasive surgeries will augment neurovascular devices business growth over the coming years. Advancement of novel technology has led to significant demand for procedures with minimum invasion. Minimally invasive procedures offering benefits to the patients including decreased pain, less blood loss and cost-effectiveness will increase adoption of neurovascular surgeries, thereby accelerating neurovascular devices market growth. Technological advancements in neurovascular devices will serve as a high impact rendering factor for neurovascular devices industry growth. Advanced neurovascular devices are manufactured by considering genetic factors as well as pathophysiology of neurovascular diseases. Firms are focusing on new product launches by adopting novel technologies to capture greater profits and offer efficacy of disease treatment. For instance, in June 2018, Terumo announced about the U.S. FDA clearance of SOFIA Catheter, a technique for successful revascularization of patients. Thus, increasing technological advancements will escalate neurovascular devices demand and adoption, further stimulating the market size. Greater cost associated with neurovascular devices and treatment can slower the adoption and customer preference for the devices. 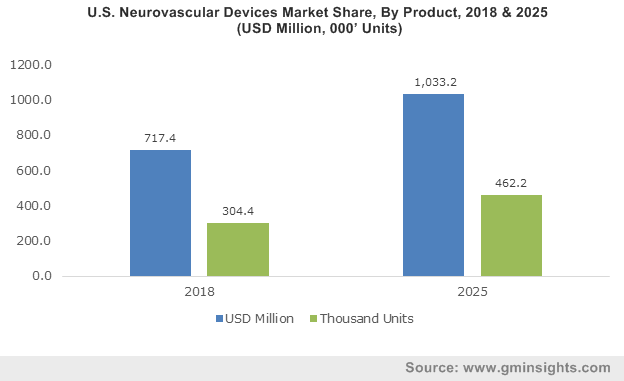 In addition, challenges pertaining to commercialization of neurovascular devices due to lack of resources and proper business environment across emerging economies may restrict neurovascular devices market growth in the foreseeable future. Embolic coils product segment accounted for the largest market size of USD 523.4 million in 2017. Benefits such as minimal invasion, shape and size flexibility offered by embolic coils will contribute to the segmental growth. Embolic coils are cost-effective and offer sub-optimal angiographic results. With increasing patient pool suffering from brain aneurysm, neurovascular devices market will foresee remarkable increase in demand over the foreseeable future. Flow diverters product segment will grow at 4.4% CAGR throughout the forecast timeframe. Flow diverters are widely used to treat brain aneurysm. Flow diverters do not need catheterization and possesses less risk of procedural rupture of aneurysm. Availability of technological advanced flow diverter such as silk flow diverter that is available in variable diameter and porosity will in turn impel demand for flow diverters in the upcoming years. Coiling procedure technique segment held largest market share of 36.3% in 2017 and is estimated to grow at robust pace. Coiling procedure avoids open surgery, thereby prevents scarring. In addition, the procedural technique prevents bleeding by filling the aneurysm with coils. Moreover, stent-assisted coil embolization offers better safety and efficacy for treatment of aneurysm. Above advantages coupled with greater epidemiology of aneurysm will impel coiling procedure technique segmental growth in upcoming years. Flow disruption technique process segment will foresee lucrative growth at 5.6% CAGR over the forecast timeframe. The technique is effectively used to remove large aneurysms and wide-neck bifurcation aneurysms. The surface of the intra-aneurysmal device is smooth and assists development of neointima. Flow disruption technique has also witnessed substantial innovations in recent years. Advancements such as intrasaccular flow disruption for treatment of cerebral aneurysm will support segmental growth owing to growing incidence of aneurysm. Furthermore, technological advancements in the technique and devices used for the process will lead to increase in demand for flow disruption technique segment in recent years. Ischemic stroke therapeutic application segment accounted for largest segmental share of 43.2% in 2017. 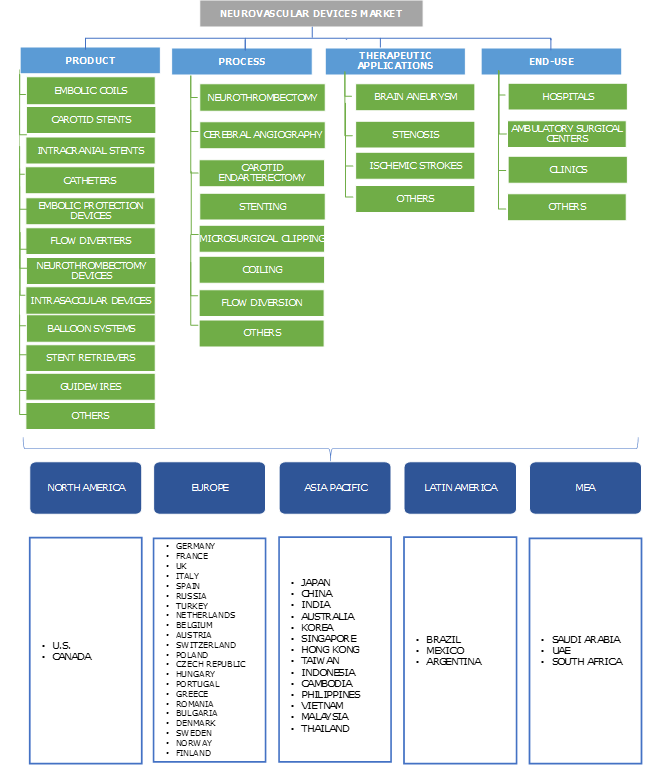 High growth is attributable to rising patient pool suffering from ischemic stroke across the globe. According to World Stroke Organization, 1 out of 6 people globally will be affected by stroke. 15 million people are affected by stroke annually and a large percent of strokes are ischemic strokes. High mortality rate as a result of ischemic stroke will thereby accelerate the adoption rate of neurovascular devices owing to rapid product innovations by various firms in the forthcoming years. Stenosis therapeutic application segment is projected to grow at lucrative 3.5% CAGR during the forecast period. Increasing number of innovations in neurovascular devices coupled with rising pervasiveness of stenosis will lead to escalating demand for neurovascular devices to treat stenosis. Minimally invasive techniques for treatment of intracranial stenosis will further augment customer preference, thus impelling segmental growth over the upcoming period. Ambulatory surgical centers (ASCs) segment will foresee momentous growth at 5.3% CAGR throughout the forecast years. Rapidly rising number of ambulatory surgical center and increasing demand for treatment procedures in such facilities will aid segmental growth. ASCs offer cost-effectiveness and time-effectiveness that drives the patient preference for surgical procedures in ASCs. Above factors will offer significant neurovascular devices business growth opportunity in upcoming period. U.S. market held largest revenue size of North America neurovascular devices market with 85.2% market share in 2017. High prevalence of ischemic stroke, aneurysm and stenosis will aid U.S. neurovascular devices industry growth. According to Brain Aneurysm Foundation, around 6 million Americans suffer from unruptured brain aneurysm. The risk of aneurysm rupture escalates as age increases. Thus, increasing geriatric population coupled with sophisticated healthcare infrastructure and technologically advanced products should positively impact U.S. neurovascular devices business growth in the forecast timeframe. China market will witness robust market growth at 4.8% CAGR during the projection period. Increasing burden of aging population in China, that escalates the risk of stroke, aneurysm and stenosis, will in turn impel demand for neurovascular devices. According to Population and Migration data, geriatric population in China is estimated to reach 1,387,792 by 2020. In addition, expanding R&D activities on neurovascular devices will assist Chinese neurovascular devices market growth in forthcoming years. Some of the prominent industry players operating in global neurovascular devices market Medtronic, Stryker, Terumo and Johnson & Johnson. Companies are undertaking strategies including mergers, acquisitions and new product launch to fortify product portfolio and to expand company’s presence in neurovascular devices market. For instance, In September 2015, Medtronic acquired Lazarus Effect, that will enhance ischemic stroke portfolio and neurovascular business in forthcoming years. Development of stents and detachable embolization coils marked the advent of neurovascular devices. The first mini-coil was launched in 1978 that increased thrombogenicity. Technological advancements in development of embolization and thrombectomy devices further resulted in growth of neurovascular devices industry. For instance, in March 2017, Integra LifeSciences announced launch of newly integrated system next generation CUSA Clarity Ultrasonic Tissue Ablation System. Furthermore, rising demand for minimally invasive procedures should drive neurovascular devices market growth in the forthcoming years.